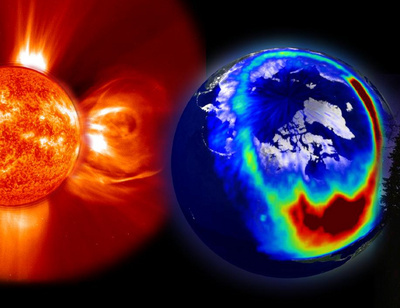 March 18th; NASA's Sun Earth Days team is joining forces with NASA EDGE to explore the violent nature of our Sun at the peak of solar activity and share discoveries from NASA's heliophysics and planetary missions during this exciting period. NASA EDGE is an unscripted, non-traditional video podcast (vodcast) designed to highlight all things NASA in a unique and fun way. By using a combination of funny, offbeat and informative sketches, features and interviews, the NASA EDGE team creates a vodcast that reaches a much broader online audience. Built in the framework of sports talk radio (i.e. Mike and Mike in the Morning - ESPN Radio), NASA EDGE has generated a positive buzz for NASA in a way in which young teens and adults can relate. In a historic first, the MESSENGER spacecraft successfully entered orbit around Mercury at approximately 9p.m. EDT on Thursday March 17th after a six and half year journey. This is the first time we’ve deployed a craft in orbit around the Solar system’s innermost planet. After ensuring the craft’s systems are working well, the probe will begin collecting data after April 4th. This historic mission will explore the chemical composition, geology, and the magnetic field of Mercury. The Cassini spacecraft is capturing images of spring rains on Titan. Extensive methane rains have darkened the equatorial regions of Saturn’s moon and scientists believe these areas remain wet after the rainstorms. Years of observation of the moon’s weather systems show that Titan’s global atmospheric circulation pattern responds to the changes in solar illumination, influenced by the atmosphere and the surface. Saturn and its moon experiences its spring equinox in August 2009 (a Saturn year is 30 of Earth’s) and this is reflected in the shifting weather patterns on Titan. Scientists look forward what other surprises Cassini’s mission will bring. NASA has developed a new website focusing on women in the agency who contribute to its mission in many diverse ways. Consisting of videos and essays detailing stories on how these women overcame large obstacles to pursue their dreams in an industry where just being a woman is the biggest obstacle. The site was created in response to President Obama’s executive order creating the White House Council on Women and Girls, which provides a coordinated federal response to the challenges confronted by women and girls to ensure that all cabinet-level agencies consider how their policies and programs impact women and families. NASA is also hoping that the website will inspire more young girls to pursue a career in science. Here is feminism at its best. What did the Romans say? "Corruptio optima pessima." Women have been in the Constellations for years. It's about time that We flew to 'Jupiter and Mars' - ha ! It helped that Barack Obama had two daughters and no sons.